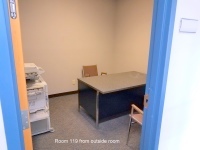 This office accommodates yourself and 3 clients. Comes furnished with desk and chairs. 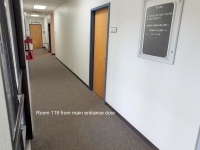 It is the first office just left of the main entrance so it is easy to find. It is relatively quiet. 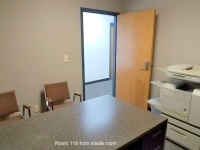 Just to your right as you enter is the lobby across from the reception desk. Hector mans the desk from 9-5 Monday thru Friday and can receive/direct clients to your location.